There’s Brandy in the Jar – Oh! 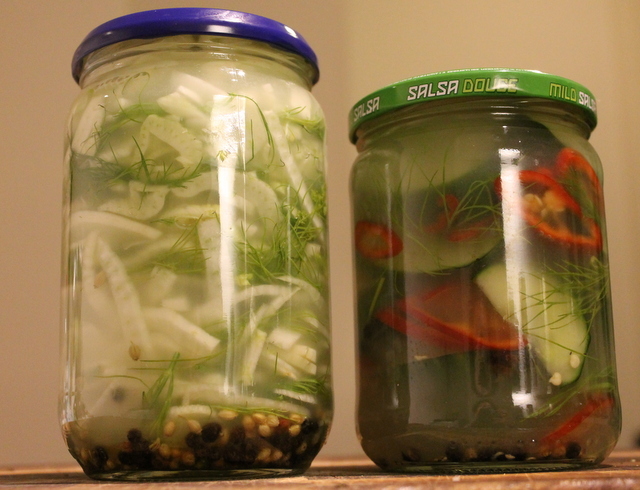 As you will probably have gathered if you have read more than this post, I do like to get the maximum use from my produce, especially if I have grown or gathered it myself. In this, the last of my Japanese quince posts, I am getting even more out of my harvest. I’m also starting right in on my resolutions, by blogging about booze. And I assure you, this one couldn’t be easier. I have read a lot about quince liqueurs with vodka and honey. 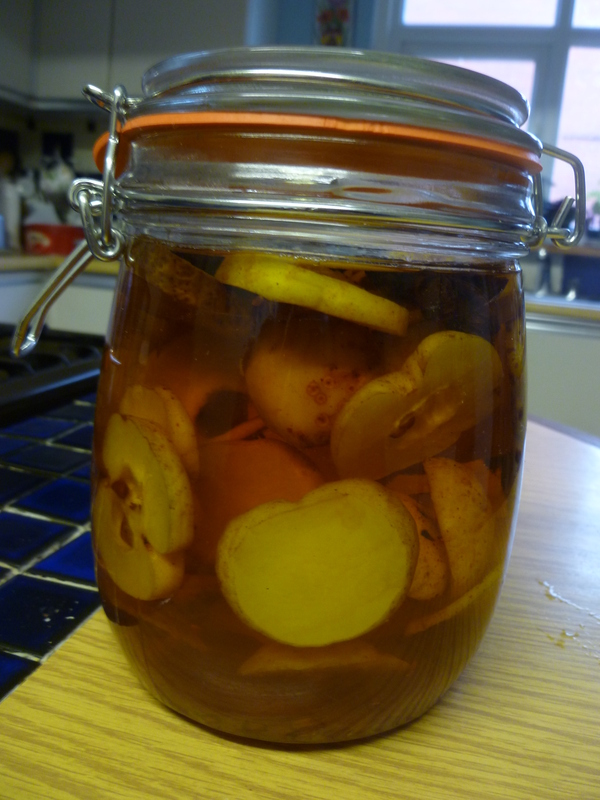 I have also read a fair bit about quince brandy, which sounded a lot better to me. Especially after I was given a copy of Salt, Sugar, Smoke by Diana Henry for Christmas, and she gives some really tempting takes on Kir Royale using quince brandy and either French cider or English sparkling white wine. I am also thinking of taking the best of both ideas and making something with the brandy and this very special cider from Sussex, Gospel Green Champagne Method Cider (look out for them, they are from West Sussex, but don’t have a website. 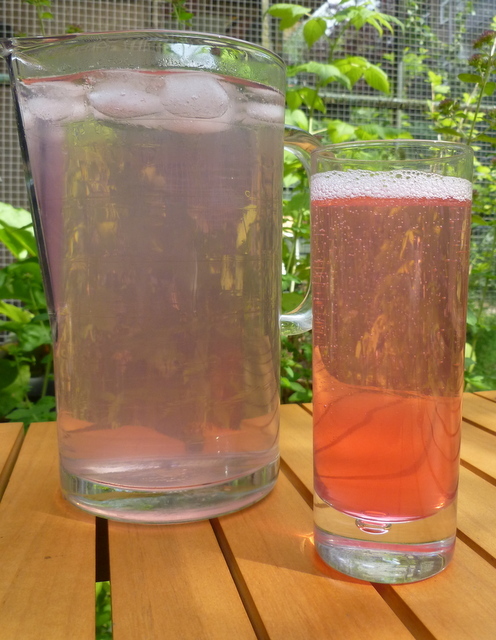 This is truly remarkable “bubbly” style cider) if I can get hold of some. Fruit brandies of this kind, and those distilled from scratch used to be pretty popular. You may know them as eau de vie, rakia, or brandywine, and they are still popular across Europe, but especially in the Eastern countries – Bulgaria, Serbia, Macedonia, and as far down as Turkey. Of course, these are meant for quince or Cydonia oblonga, but I see no reason why they shouldn’t translate into Japanese quinces too. I selected some of the nicest fruit, and set them aside. Then the next dilemma was whether or not to go with sugar. For advice on this, I turned to Twitter. Luckily for me, preserving queen, Vivien Lloyd and beekeeper extroadinaire, Zoë Lynch were listening, and they both said sugar was wise, so sugar it was. Thank you both, if you are reading, although I didn’t go with that much, because I figured that I can always add sugar, but I can’t take it away if the brandy is too sweet. The brandy needs to steep for anything up to a year, so I haven’t tried this yet, but when I do, I’ll let you know how it goes. Slice the quince, but leave the seeds in. Layer the quince into the jar, and sprinkle the sugar and the star anise between the layers. Top the jar up with brandy. The fruit will be fine in here, as long as the jar is full, and the fruit doesn’t get exposed to air. I used a 700 ml jar, so needed a fair bit of brandy. Leave it in a cool, dark place for up to 12 months, taking it out to shake it when you remember. Strain off the brandy, and pour into a sterilised bottle, where it will keep until you have tracked down some of that excellent cider. Top up with more brandy, if necessary. Oh, and I’m also thinking that there will be a good use for the fruit, possibly added to apples. I’m sure I’ll think of something tasty to do with them. 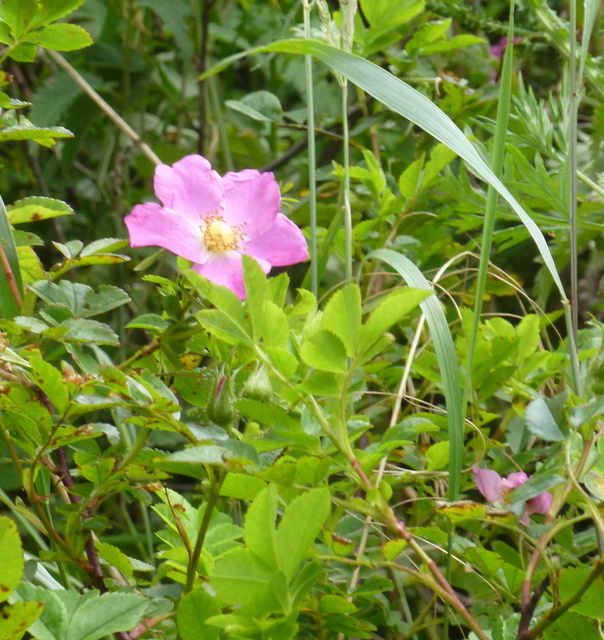 At the same time as we collected all the elderflower, we were also delighted to find some wild roses. The most common of these is the dog rose, but they have mostly gone over in the more accessible places. I did manage to get a photo, but couldn’t reach the blooms, as they were on a steep slope, and behind a lot of brambles. Luckily, we also came across a load of what I think is most likely to be prickly rose, or rosa acicularis. This is a really beautiful rose, with abundant, dark pink flowers. They also have a lot of thin thorns on them. I was so excited to find them that I forgot to take pictures, but I’ll try to go back soon to get some. When the sunshine comes back. If the sunshine comes back. The good news is that all rose petals are edible. The more highly scented, the better they will taste. As well as some basic foraging rules please be careful that the roses that you use have not been sprayed with any pesticides, which can be an issue if you are foraging in a park. Another word of caution; if you are allergic to bee stings, like I am, please check each flower before you pick the petals. Bees love roses, and will spend a lot of time feeding from each one. I very nearly picked one up with some petals, but it warned me by buzzing angrily, and I quickly dropped the petals. Bees are quite polite really, and will warn you before they sting. You could dry the petals, and use them in cakes and jelly, or even brush them in egg white and dip them in caster sugar to crystallise them and then use them as a cake decoration. 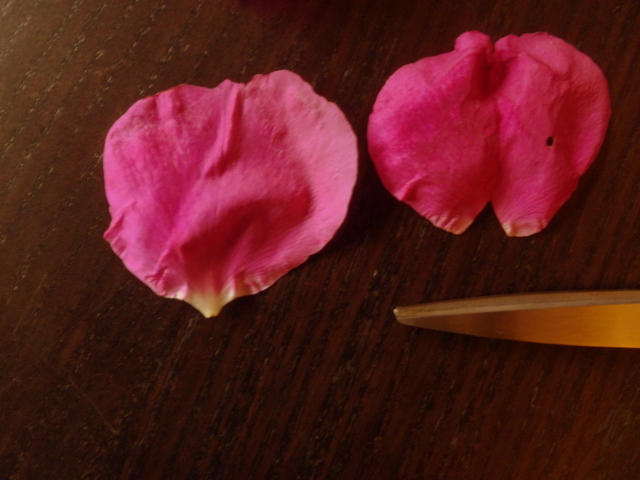 When you use rose petals, you need to remove the claw, or the part where by which the petal is joined t the rest of the flower. This is bitter and can taint your produce. I usually just snip them off with scissors. The first thing that I made was a cordial. 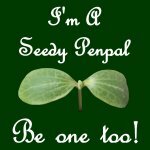 This recipe is inspired by one that Sandie made at Herb and Wild Food Recipes. Sandie intended to make a jam, but actually made a syrup with dog roses. I used the same technique to prepare the roses, and then made a cordial as I would normally. 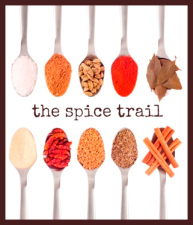 This is a great blog, full of wild food recipes, so please do go and have a look. It has also taken on the dark pink of the rose. I have had it as a refreshing drink, but I’m also going to try this in a syllabub, and maybe to cook some gooseberries in. 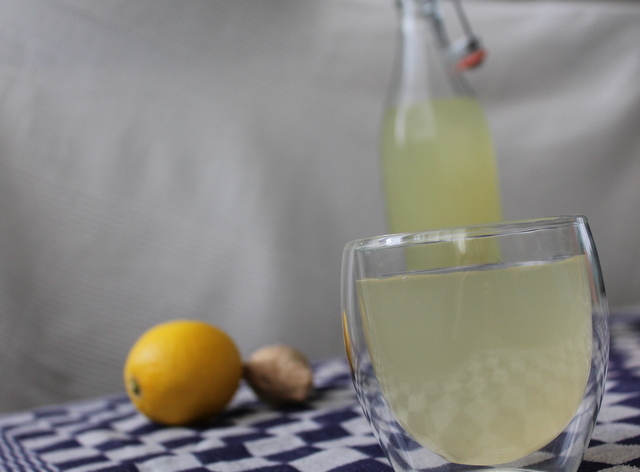 If you have any suggestions for ways to try this cordial, I’d love to hear them in the comments. Sterilise a 500 ml bottle and the lid. You can do this in a number of ways. I find it trickier to get bottles clean in the dishwasher, as I would do for jam jars. You can wash them in hot soapy water, using a bottle brush to get into the nooks and crannies. I give them a good soak in the steriliser I use for brewing before I rinse, and put in them in a w arm oven (150°C). If you have a pressure cooker, you can also hold it in steam. 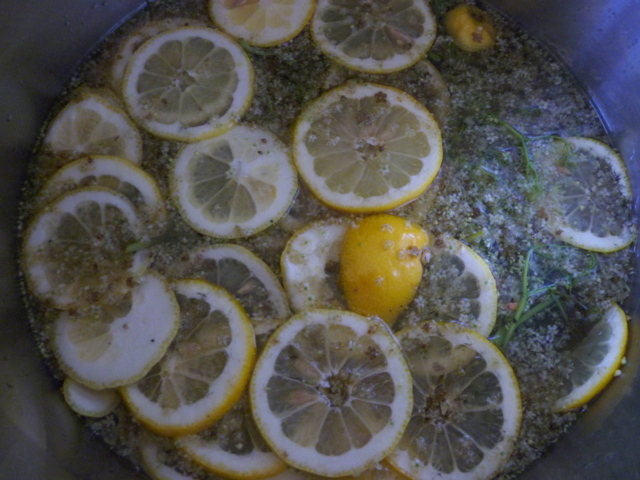 In a saucepan, add the lemon juice to the flower petals and the water. Simmer for 15 minutes. Strain through muslin, and return the liquid to the saucepan. As you would expect, I didn’t throw out the rose petals. I have a great recipe for them to come. You can refrigerate or freeze them, if you want to use them later. Add the sugar to the rose-water, and heat, stirring until the sugar has dissolved. Allow to simmer for five minutes, then hot-fill the sterile bottle. Keep this little jewel in the fridge. It is that glorious time of the year when lots of delicious produce is in season. In the garden broad beans, the last of the asparagus, courgettes, the very first tomatoes (if you can grow them under glass); and in the hedgerow you will find nettles, dock, sorrel, mallow, and many other delicious treats. It is also your shortish window for the elderflower. The elder has been used and revered for centuries. It has provided stakes, shelter, medicine, fuel and food to animals and man since prehistoric times. There is a lot of folklore and superstition around the elder, and in some places people would leave offerings for the Elder Mother before they picked from the tree. In early summer, hedgerows froth with white elder flowers at hedge height, and moon daisies at their feet. It is a time of great potential, and great recipes. Although, it is also important to remember that the potential of this tree is not just about summer, but that there are also good things to be had at all stages of fruiting, as well as the berries being a valuable food supply for many bird species, who will be laying down reserves for the coming winter. 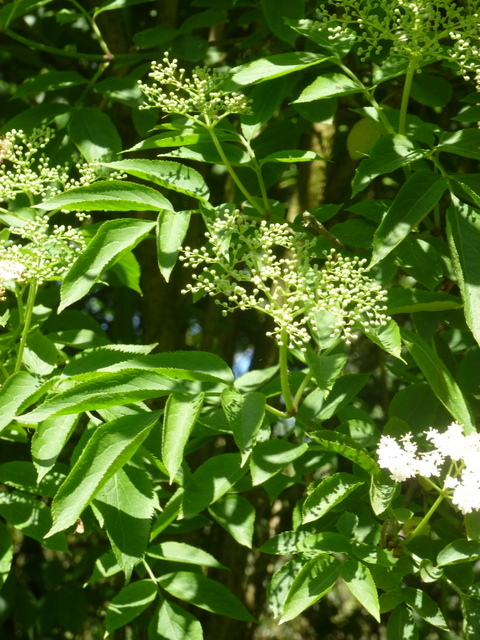 Luckily, the elder is ubiquitous in most parts of Europe, and they seed themselves easily, even in places where there is no tradition of a hedgerow (such as the Netherlands). 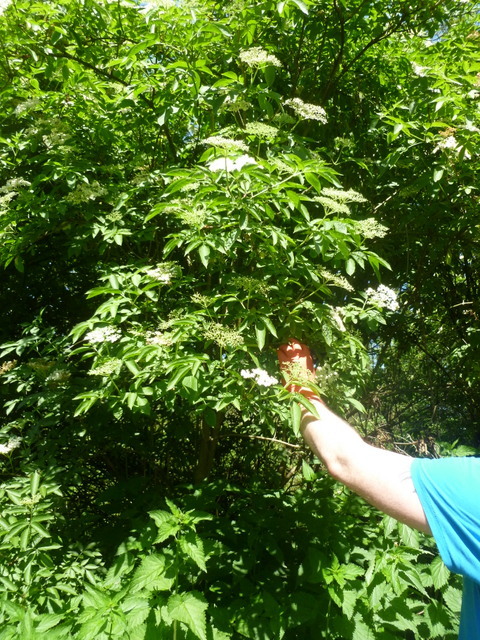 As long as you don’t take all of the blooms from a single tree or shrub, there will be plenty left throughout mid-May to mid-June to allow for your own use of elderberries and for the birds, as well as allowing the tree to reproduce. This year, I have also learned some other tricks from wise women on Twitter about uses for this wonderful tree. Cally from Country Gate mentioned that elder leaves make a good pesticide against aphids. I have been plagued by them this year, seemingly more so than in previous years. She says to simmer 500 g of elder leaves in 3.5 l of water (use an old saucepan if you can for this), and replace any water lost as steam. Strain, and bottle. This concoction should keep for 3 months, and is great for aphids. Liz from Forage also mentioned that the buds of elderflowers are delicious in salads and omelettes, and lend a smoky flavour to a dish. I picked a couple of elderflower brackets in bud to test this, and they are really very good in an omelette aux fines herbes. Although it is probably a little late in the year to get the buds now, I am definitely going to play a little more with this next year. When picking the flowers, try to go in the morning, on a sunny day, when the pollen levels will be at their highest. Try to pick fresh, white brackets with no brown patches or blemishes, as these have the best taste. Elderflowers will keep for a couple of days, but they start to go brown quickly, and will deposit pollen and nectar, which is essential for the flavour, so it is best to try to use them on the day that they are picked. 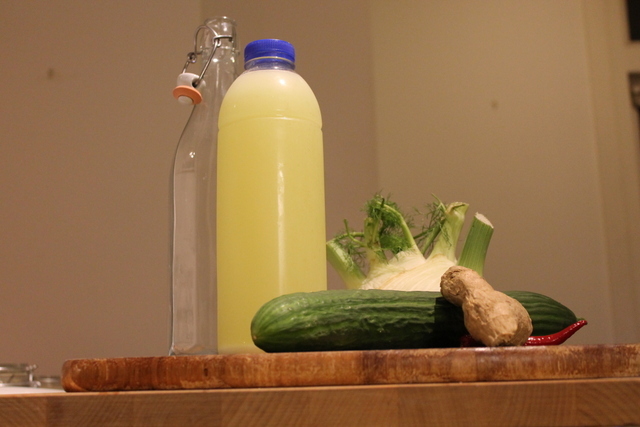 This is my recipe for elderflower cordial. I originally cut it from a reader’s letter to the Guardian, years ago. Unfortunately, I don’t have that cutting anymore, so I don’t know the name of the person who sent it in. As you will see, the recipe is basically based around the number four, so once you get the amounts, then you will understand why I have misplaced the clipping. Elderflower cordial is a great way to preserve the delicate taste of summer, and is the basis of many things, from refreshing drinks and summery cocktails, to use with other fruits and in many desserts. 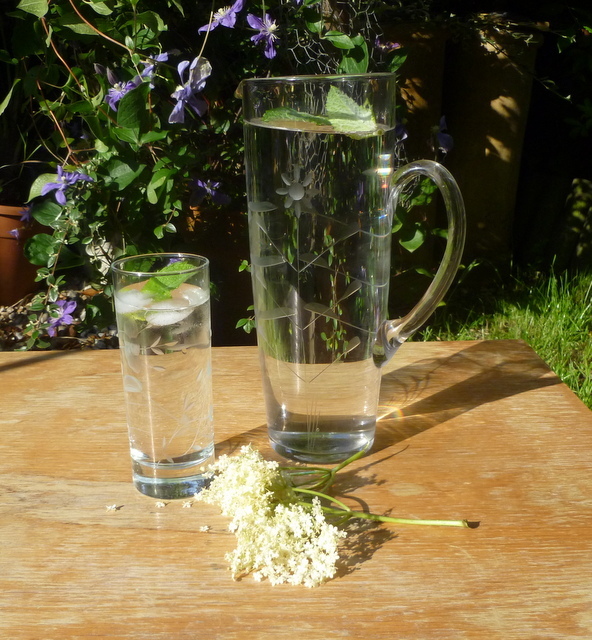 I’m going to be writing about some of my elderflower cordial recipes in the coming months, but I’d really love to hear how you use it in your recipes, in the the comments. I often only have raw cane sugar in the house, which makes the cordial slightly darker than you may be used to – it still tastes delicious, but most people use white sugar. You can get citric acid from home-brew shops and possibly the chemist (in the UK). If you cannot find citric acid, then add the juice of another lemon. If you use this method, I would recommend freezing the cordial once bottled, to make sure that your cordial does not go mouldy. Steep the blooms in the boiling water in a large, non-corrosive container. Add the sugar, lemons and citric acid, and stir until the sugar has all dissolved. Cover with a tea towel, and leave in a place that you will walk past daily. Leave for four days at room temperature, stirring well twice a day. Sterilise some bottles, and a funnel. You can use new ones, or old oil, vodka or screw-top wine bottles will also be fine. I find that bottles are much less likely to get thoroughly clean in a dish washer, so I clean mine by hand with a long bottle brush, then I sterilise them with campden tablets, which are also available from home-brew suppliers. This recipe makes a little over 4 l, so you will need an appropriate number, plus one for luck. 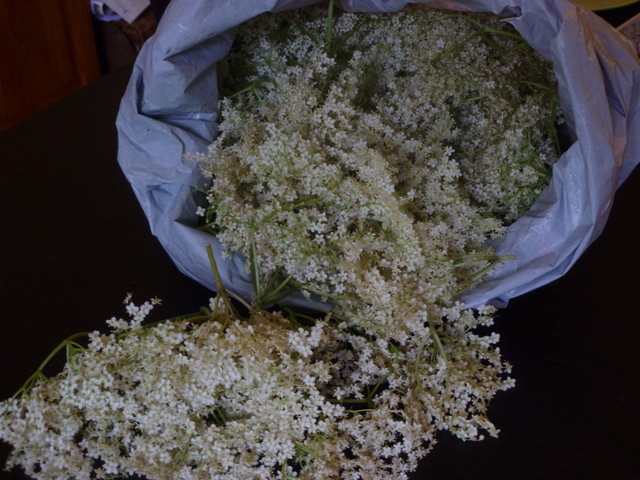 Strain the elderflower through muslin, then bottle and seal tightly. This should keep for up to a year. Once it is opened, store the bottle in the fridge. Then pour yourself a nice tall glass of diluted cordial, add mint and some ice, and think about what recipes you could use the cordial in. No Mince Pie and Mulled Wine party would be complete without some mulled wine. This spiced wine is traditionally flavoured with the Christmassy flavours of nutmeg, cinnamon and cloves. I think the practice of spicing and warming wine is pretty international, and many European countries have a version of it, calling it Glühwein, Glögg, or Vin fiert. In the UK, we are also quite prone to mulling cider in a similar way, which is fantastic after a day in the cold. One of my friends brought some cider too, so everyone got to try out the traditional taste of the West Country. The recipe for red and white wine is essentially the same, and don’t let either of them boil. Stud the citrus fruit with the cloves. If you are mulling red wine, then halve the orange before you do so. Put all of the ingredients in a saucepan, and heat gently until the sugar has dissolved. Don’t let the wine boil. If you have time (and no thirsty guests already) you can allow the spices to steep for a few hours, and reheat before serving. It will also be fine if you serve it warm, straight away. Bay leaves are also an interesting addition to mulled white whine, so bung a couple of them in as you heat it.